Listermann Brewing is a brewery that is nestled away just off of the campus of Xavier University here in Cincinnati. Known not just for its beers as a brewery, they are also noted as being a top supplier of supplies for home brewers. 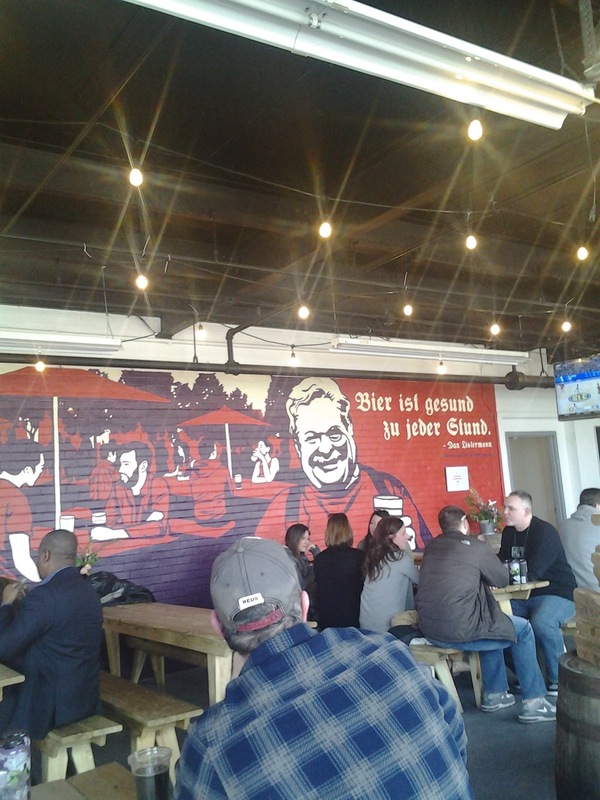 Being a person that loves to review and discuss beer, it is always good to find time to get out in the community and see some of the local spots and in the Cincinnati area, we do have many. Listermann did well providing a nice selection of beers from which to preview and had a total of 12 being available on my visit, along with a wine for the non-beer drinker. The variety shown was fitting and allowed for a good covering of all to be offered. There was definitely enough here to intrigue the craftiest of craft beer drinkers for sure, and a good amount of beers for experimenting and satisfying the taste buds. Listermann did well providing a nice selection of beers from which to preview and had a total of 12 being available on my visit, along with a wine for the non-beer drinker. The variety shown was fitting and allowed a good covering of all to be offered. What I like to do when visiting a brewery is get an essence of all of their beers by going the flight route. This can give a nice sampling of what is offered and also proves to be an effective way to gain an understanding of the beer under review. Listermann actually proves to have one of the best deals on flights from any of the breweries I visited with each 5oz pour being only a dollar ($3 for Barrel Aged). That my friend is a deal or a steal…whatever you would like to call it. Flight 1 as pictured above from left to right: Maple Bacon Barrel Aged Coffee, Brewer’s Delight, Gravitator, Riveting Rosie. 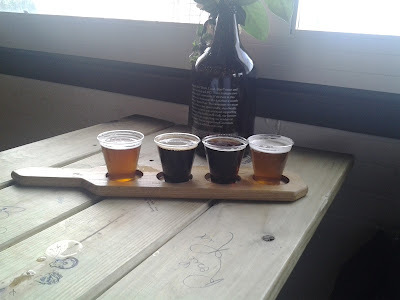 My first flight as noted involved the four beers shown and from the great bacon aroma and nice smokiness of the Maple Bacon BA Coffee to the crisp and refreshing quality of the Riveting Rosie, my mouth was able to enjoy some great mouthfeels. The Gravitator was sneaky in that the ABV was not even detectable, and the Brewers Delight with its pineapple and mango qualities was just juicy goodness. 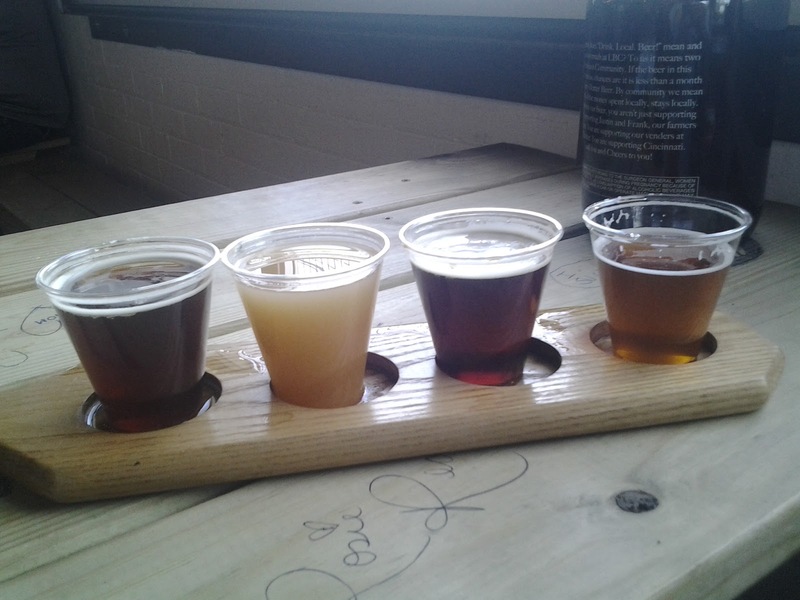 Flight 2 as pictured above from left to right: Roots, Cranium, Chickow and PAC. My second flight was able to provide even more flavor and this one introduced an old favorite, Chickow, which is so decadent that it’s like drinking a brownie in a glass. But my introduction to the Cranium was a pleasant surprise as I do enjoy barrel aged beers and you really had that coming through on this one. It really had my mouth going for sure. There was also PAC which was a dedicated IPA to Tupac and the Roots, a clean and crisp beer that provided a nice effervescence and refreshing taste. But the one thing that I would add in the handling of flights would be for them to indicate on the paddle what is what. This helps for people to remember and is a good convenience. The key would be adding a number to the board for each choice which would then allow for an easy writing down of the details when serving. All in all, my time spent at Listermann proved to be a fantastic time and definitely is a place worth visiting for any beer lover here in the Cincinnati area. I didn’t get a chance to check out the home brewing store but will on my next visit. If you are in the Cincinnati area then I say definitely look to check them out. They also pet-friendly as well as family friendly as they have various board and other games around for kids or parents alike. 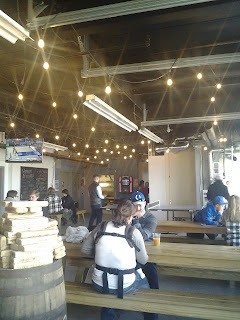 If you would like to visit their website then you can also click the link here: http://listermannbrewing.com/. With that all being said, Cheers, and Keep Drinking Good Craft Beer!! !